Maybe they do an excellent job, but they do nothing to try to teach presenters in Cornwall how to pronounce Cornish place-names. To represent oo with breve, use o&#x035D;o to get o͝o. Non-IPA double o with a breve can be represented in Unicode using U+035D (combining double breve): o͝o. Thank you, thank you, thank you, SH!!! 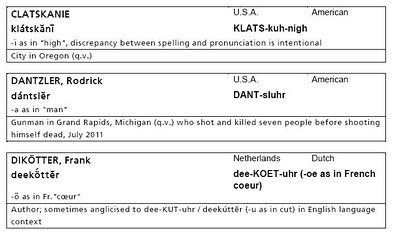 I am mystified as to why phonetic respelling systems often use "h" to indicate a short vowel --e.g. 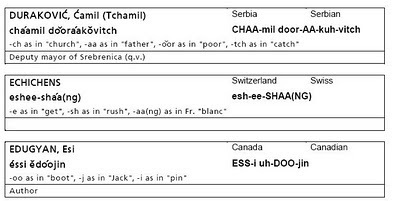 "ih" for KIT and "eh" for DRESS. The only English words in which a vowel is actually followed by "h" are "ah", which has the PALM vowel, and "oh", which has the GOAT vowel. So where did this convention come from? And is there any evidence that the uninitiated understand it? VP - yes you're right. In the (probably now defunct) American encyclopaedia The World Book, they used a ludicrous respelling system that added a silent H after most vowels. Austria would be respelt AH-stree-uh. AH-stree-uh seems pretty clear to me. In my accent it's OSS-tri-yuh. Yes, I know more accurate ways of representing pronunciation to people I know to share certain conventions. But writing for strangers I don't see a better alternative. I presume uh is the model on which the others are based. 1. 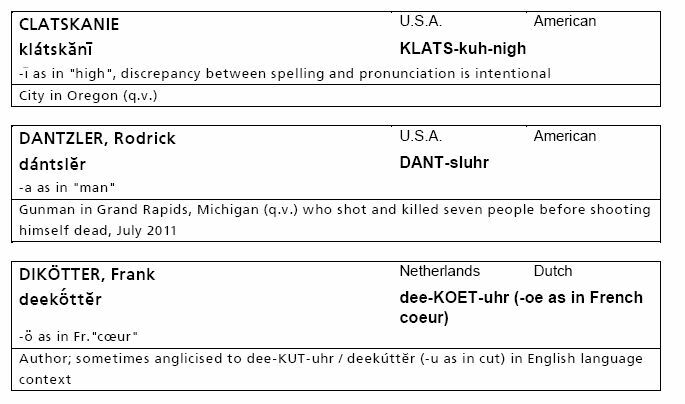 TRAP, DRESS, KIT, LOT, STRUT — the 'short vowels' — are characterised by a closing single consonant letter (when syllable-final). 2. H is a consonant letter which can't represent a sound when word-final. 3. Therefore AH, EH, IH, OH, UH represent the 'short vowel' sounds —followed by nothing. Although not based on reality, the scheme does get support from the spelling of interjection Uh! and some names in -eh: Mannasseh, Tecsumeh. Despite the shaky support and naive logic, the system clearly had something going for it, because it was accepted and survived for some time. What you say makes a certain amount of sense, except that it contradicts the spelling/sound correspondence of the actual words "ah" and "oh". Since the "short vowels" must always be followed by a consonant in stressed syllables, why doesn't a respelling system exploit this by always following them with a representation of the next sound that follows in the word? 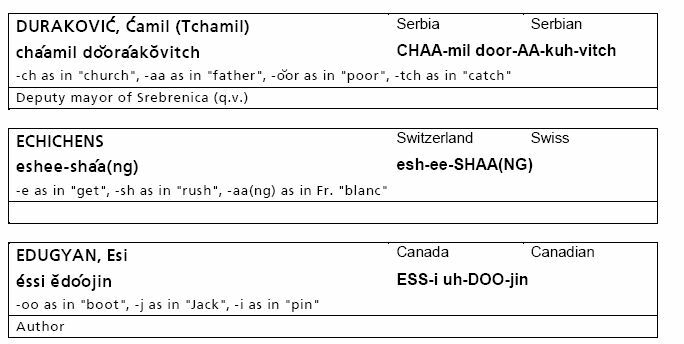 Using "uh" for schwa doesn't work for me since it suggests the STRUT vowel, which for me is distinct from schwa. I actually think that "a", in an unstressed syllable, represents schwa pretty unambiguously in spelling: the only other possibility is TRAP but that is rarely/never found in unstressed syllables. That solution varies on how it shows. Yesterday on one computer, the breve was fully over both syllables, but a little greyed out. Today on a different computer, the breve (now properly dark) is double wide, but centered over the second O. 1. As rationales go, it's a very simple one — which is is a comfort to both writer and readers. By contrast, IPA or other symbols feel distinctly uncomfortable when first encountered. Even simple diacritics are a pain. 2. The rationale is based on an existing sub-system — covering the 'short' values of the five vowel letters — which is already family to (almost) anyone who is literate in English. 3. It's actually an advantage that the sequence VOWEL+h+CONSONANT is virtually non-existent in English spelling. The more the transcription resembles the orthography, the less likely the reader is to pay attention. Of course, this doesn't matter if the two are obviously equivalent — but in that case, the transcription would be rather pointless. • These words are pretty rare. • The sounds are pretty well confined to the end of words — precisely where no 'short vowel' is going to be transcribed. I don't think we should expect too much from a mainstream popular dictionary produced for native speakers. A given non-specialist user looking up a given word at a given time is probably after just one piece of information. The problem for the compilers is that they can't predict which: they can't assume, for example, that all users want to know only the spelling or only the pronunciation or only the most unusual of the meanings. So the compliers are forced to give pronunciations for every entry. But the typical user will very seldom consult them. I stand by uh for schwa. The only thing that woks better for nion-secialists is er — except that it doesn't work at all if the reader has a rhotic accent. Some people on the old Board preferred @ — but this suggest æ to me in the same way as uh suggests ʌ to you. Ellen K.: Yes, the exact display depends on what browser (and what version of the browser) you use, and what fonts are on your system. This is true of all text, really. To really do the job properly -- and if we can rely on a sufficiently intelligent readership to make use of any key that's provided, so that the system isn't unduly constrained by a need to keep it simple -- I think we'd have to differentiate between non-English place names, which should probably be pronounced in a uniform way that doesn't depend on the newsreader's own accent of English, and English place names, where for the newsreader to put on an accent other than his/her own might cause offence. A scheme to cope with this should have an arsenal of both phonetic and GOAT-vowel-like symbols. My wife, a native-speaker Russian, was appalled. If you're going for something resembling authentic pronunciation, why mess with the first two vowels of the surname? The combination áy leads the reader to say the English FACE vowel, when e for the DRESS vowel would be closer to the sound and closer to the spelling of the transliteration. She would like to represent the first vowel as the STRUT vowel, which would need u. Perhaps it would be easier on the reader to mark the vowel as reduced: rŏz̲h̲. It's not impossible to type this transcription scheme on a computer, but it is a pain. ...is a joke. Even if it was entered by mistake, it must have been left in as a joke.